The story behind your midnight chips. OVER THE PAST few years, the grub at Irish festivals has evolved from filthy feeds to more creative and high-end fare. Gone are the days when you had to make do with curry chips. Nowadays, you can feast on everything from falafel to poutine to lobster rolls. But what are the logistics of running such an enterprise? We spoke to three food truck owners – Fred Peretti of Lala Poutine, Ferdia MagLochlainn of Home Fries, and Julia Hemingway of Julia’s Lobster Truck – about everything from the sourcing of ingredients to dealing with well-lubricated punters. Fred Peretti is the man responsible for bringing poutine to Ireland. Having originally worked in the financial industry, the French native pivoted to the food industry during the recession. He opened a chicken rotisserie food truck called La Rotisserie in 2012, which proved popular. Not long afterwards, an acquaintance introduced him to the concept of poutine. Poutine is a traditional Canadian dish consisting of chips covered in cheese curds and gravy. Peretti and his friend decided to partner up to start a poutine business in Ireland and Lala Poutine was born. They initially encountered difficulty finding some of the ingredients in Ireland, namely the cheese curds. “Curds were impossible to find so we managed to get someone to make them for us on order,” he says, refusing to divulge any further details. Over the last few years, Lala Poutine has built up a presence at festivals like Body & Soul, Knockanstockan, Electric Picnic and more. Catering at festivals is time-consuming work with the days typically starting at 7.30am and continuing until 5am the following morning. Peretti says he will usually have a staff of five working the stall over the course of the day, but even that leaves little time for clocking off and wandering around the festivals. “Last year we were in Mindfield at Electric Picnic and the arena was closing at ten, so we had a good chance to experience the festival,” he notes. So what’s it like dealing with customers in the wee hours? Asked about how many units they sell on an average day, Peretti says he can’t estimate and notes that its dependent on loads of factors, including weather and positioning onsite. This summer, Lala Poutine will be keeping busy at festivals like Townlands Carnival, All Together Now, BARE In The Woods and Electric Picnic. Just don’t ask him for his secret recipe. “If you give me the recipe for Coca Cola, I’ll tell you that,” jokes Peretti. In recent years, Home Fries has become a regular feature at music festivals across the country. 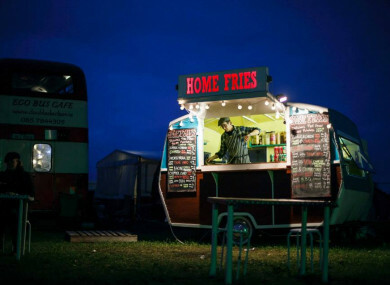 The brainchild of Ferdia MagLochlainn, Home Fries was founded in 2014. After a period of experimentation with different dishes, MagLochlainn recognised that his fried potatoes were quickly becoming the star of the show and Home Fries was officially born. “It was also at this time that I found and renovated the vintage caravan, which has become an integral part of our brand,” he adds. Indeed, preparation for any festival usually begins with the caravan. Then comes the staff rotas, health and safety inspections, and setting up on site. One of the trickiest elements of preparation is calculating how much stock to bring. Once the festivals get underway, he typically has twenty hour days, starting at 8am. They continue serving dishes until approximately 4am. Because of that, MagLochlainn says he rarely gets to experience the festivals as a punter. Those long hours mean they encounter all sorts of people at festivals. It’s hard work, says MagLochalinn, even if it doesn’t seem like it. Lobster and oysters may not seem like traditional festival food, but Julia Hemingway has been bringing Julia’s Lobster Truck around to festivals for years now. Having spent years toiling in restaurants, she started Julia’s Lobster Truck. Her aim? To serve accessible and affordable seafood. On Julia’s Lobster Truck, customers can buy barbecued lobster and lobster rolls, as well as other seafood like crab, oyster and mussels. At Body & Soul this year, she served barbecued mackerel with fennel salad. “It varies really,” she says. She brings her truck to places like Kinvara, Liscannor and Bellharbour during the week. This summer, she will go to festivals like All Together Now and Electric Picnic, among others. As one can imagine, there is a great deal of preparation involved when it comes to sourcing fresh seafood and cooking it onsite at festivals. She picks up all her ingredients from around Co Clare and Co Galway before setting off. In the days before she sets off, she’ll usually work around the clock from 7am – 11pm. At the festival, she’ll usually start her day at 8am and commence trading later in the morning. Staff will usually take over for the evening shift at 4pm, but that can change if things are “manic”. “At the Picnic, it was all day and all night,” she recalls. Hemingway says she also has to be precise about how much stock she wants to bring to festivals, particularly as profit margins are so low with lobster. Hemingway sells her lobster rolls for €12.50 while BBQ lobster goes for €17. It’s a little pricier than other festival food, but still in keeping with Hemingway’s mission to make fresh seafood accessible and affordable. Email “Secret recipes, live lobsters, and 20-hour days: A day in the life of a festival food truck”. Feedback on “Secret recipes, live lobsters, and 20-hour days: A day in the life of a festival food truck”.